Let’s be honest, Frank Sinatra is mostly famous for his singing, and rightly so. Plenty of imitators, zero duplicators. You won’t get better than Ol’ Blue Eyes. I’m not a huge Frankie movie fan. I like a few of his movies, but generally they were just vehicles for his singing. One of the exceptions is “Suddenly,” from 1954. Ellen Benson (Nancy Gates) is a war widow with a young son in the small town of Suddenly. Sheriff Tod Shaw (Sterling Hayden) has been trying to bring her out of her shell for a while, but Ellen is still recovering from the death of her husband. Because he was killed in combat, she has an intense phobia of violence and weapons. Even though she likes Tod, she can’t get past the fact that his profession requires him to wear a gun. Making things more complicated, her son remembers his father as a war hero, and idolizes Tod as a peace officer, loves war movies and basically is a typical boy that wants to have toy guns, play Cops and Robbers and watch war movies. Ellen is terrified that her son will grow up to be some kind of gun-obsessed psycho. In fact, she’s in the middle of arguing about all of this with her father-in-law (James Gleason) when there’s a knock at the door. 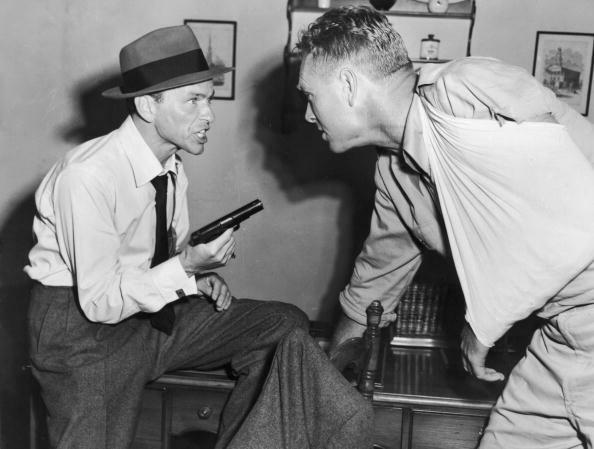 Enter John Baron (Frank Sinatra) and two associates. They tell the Bensons they are Secret Service, and inform the family that Suddenly is going to be briefly graced with the presence of the President of the United States. Apparently the President is supposed to change trains on his trip across the country in their town. The Benson’s house is the only house with a direct view of the train station. So Baron and Co want to set up a security lookout point in their livingroom. To protect the President. Of course, it doesn’t take long before the truth comes out. Baron and his men aren’t Secret Servicemen there to protect the President. They are there to assassinate the President as he changes trains. Now the Bensons are captives in their own home, at the mercy of three hired gunmen, and at least the sniper is probably psychotic. And with no way to get word to the outside world, the Bensons are the only ones standing between these killers and the President. I first caught this movie on late night local television as a fluke. I instantly loved it. The title “Suddenly” is a total misnomer. Not much happens suddenly in this movie. It’s all about the buildup to the final moment. A true psychological drama. It’s also solidly a B film. That’s not a bad thing. Like Debbie Reynolds said, It’s a shame every movie has to be a blockbuster nowadays. There’s less opportunity for new actors to build their skill and following. (Paraphrased). Anyway, while the male principles – Frank Sinatra, Sterling Hayden and James Gleason – are fantastic, the supporting cast isn’t the strongest. It’s a very good B movie, but still a B movie, so they haven’t spent much money on restoring it. So expect to have to pay close attention to the dialogue to keep up. And you’ll want to pay attention. One of the things I love about this movie is that the assassination is really just a McGuffin. That is, it’s just a device for the characters to revolve around so that the movie can explore larger themes. Are all weapons bad? Is war murder? Is it wrong to kill the President because he’s the President, or because it’s wrong to murder someone? At what age do we start introducing kids to the realities of violence and evil in the world? How much does a Presidential assassination really affect the world, anyway? (This was pre-Kennedy, btw). The style of the movie is also a little different. There’s next to no soundtrack, it’s almost all driven by dialogue, and the majority of the movie takes place in a single room. Also, there are moments when Sinatra is monologuing and starts speaking directly at the audience. Usually these are the times when his “crazy” shows. It’s a little different. And some of the dialogue the supporting characters are given is a little corny. But really, that’s small potatoes. Sinatra is compelling throughout the movie, even creepy. He basically has to carry the movie and does it well. Gleason, Hayden and Gates are all great too, even the kid, but this is Sinatra’s movie through-and-through. I highly recommend giving this one a shot. 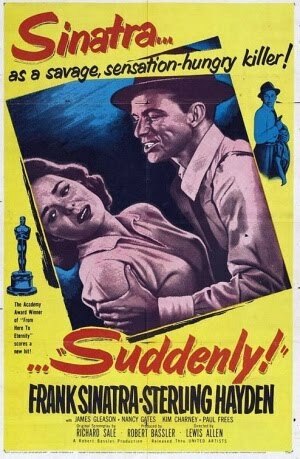 “Suddenly” will be on TCM on Friday, March 8 at 5:30 pm CST. It’s also available on Amazon Instant Video, and is free for Prime members.